I confess: I use Vista. Every day. It's the only operating system on my main computer. Vista and I have a love/hate relationship. I love the look, the built-in search tool, and the little-known 'Copy as Path' command. But Vista comes with its own special set of problems. Here I answer three reader questions about the operating system that was supposed to take over the world. Send your technology questions to answer@pcworld.com, or join the discussion in the PCW Answer Line forum. Should I keep Vista or go back to XP? For many users, choosing an operating system is a highly personal matter. You have many factors to consider, and there's no clear-cut answer. But here are some arguments for both sides, beginning with a few good reasons to go back to XP. Windows XP's maturity has given vendors more than enough time to write solid drivers for the OS, while Vista is still plagued with driver problems. 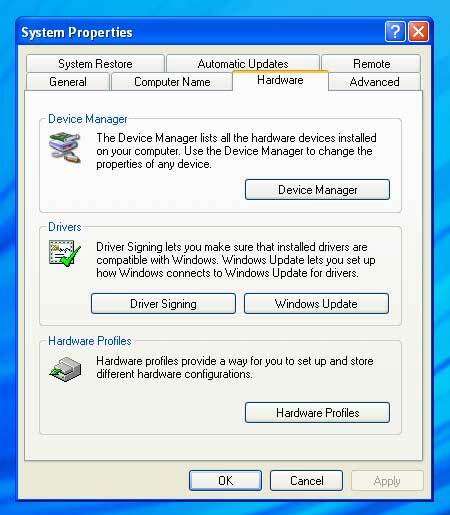 Hardware reliability: A year and a half after its release, Vista still has a lot of hardware issues--even with new gear. Plug and Play works especially haphazardly, as does waking up from sleep mode or hibernation. Speed: Given the same hardware, XP is faster than Vista. That's only to be expected; just as hardware speeds up with each new generation, software slows down with the addition of new features. Vista advantages, without Vista: You don't need Vista for fast, indexed searches. Just download the free (for personal use) Copernic Desktop Search. And Microsoft's own Windows Live Photo Gallery improves on Vista's Windows Photo Gallery, yet runs on XP. The UAC: Vista's User Account Control--the annoying thing that constantly pops up asking your permission for what you've just said you want to do--is a classic example of a good idea badly executed. Yes, a "Do you really want to do this, and, by the way, are you an administrator?" type of query is appropriate for some actions, but loading your backup program and changing the time aren't among them. On the other hand, there are good reasons to stick with Vista. Prettier looks:&#160;Okay, that sounds irrelevant. But you're looking at that screen all day, and it makes a difference. Better security: Vista comes with a better firewall, a more secure version of Internet Explorer, the above-mentioned UAC, and better encryption than XP has. 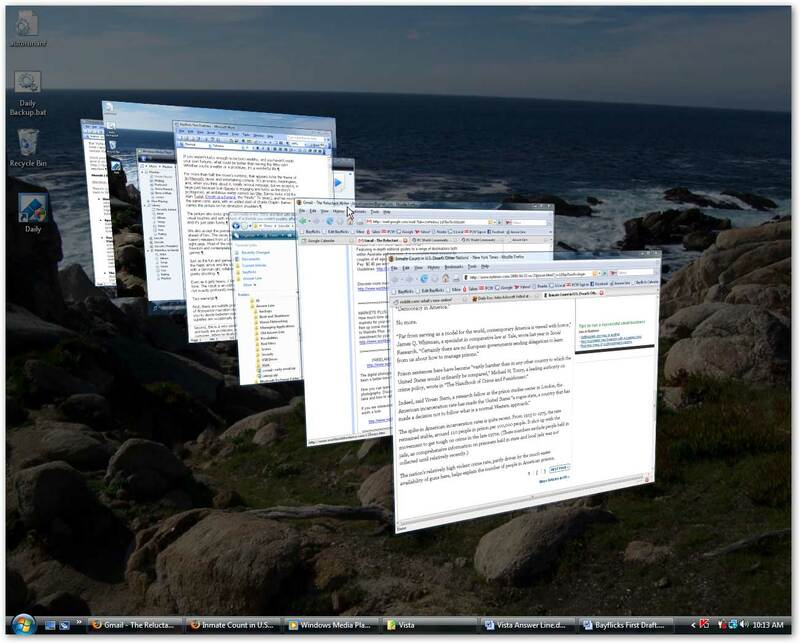 Eye-candy interface enhancements such as Flip 3D make Vista a little more fun to use than its aging predecessor. A lot of cool, little user interface improvements: Flip 3D, which you access with a press of Windows-Tab, is a great way to move between open windows. If you use a Web-based mail client such as Gmail, the 'Copy as Path' feature (Shift-right-click a file and select Copy as Path) makes attaching files to e-mail much easier. And Vista's own indexed search integrates with the user interface in all sorts of slick ways that Copernic could never manage. Fixes for&#160;shortcomings: You can improve performance by shutting off the Sidebar and other user interface "improvements" (see "Tweak Vista for Peak Computing Performance"&#160;for details). And you can turn off UAC--although you're arguably safer with it on (for more on that, see "How Can I Make Vista's UAC Less Annoying?"). Sheer laziness: Vista is already on your PC. Changing it will be a major hassle. If you do decide to abandon Vista and move back to XP, PC World has some great resources to help you on your way. Jon L. Jacobi provides excellent instructions in "Farewell Vista, Hello XP." But&#160;the article&#160;assumes you have a Windows XP CD-ROM. That's not a safe assumption, whether your PC originally came with XP or Vista. If your PC had XP out of the box, it came with a tool for restoring that operating system--probably a disc or a hidden partition for returning your hard drive to its factory condition. If that's the case, follow Jon's instructions up to the "Time for Your XP Install" headline. At that point, run your restoration tool. Afterward, uninstall the bundled software you don't want, reinstall your preferred applications, and restore your data from the backup you made following Jon's directions. If your PC came with Vista, you have to acquire a copy of XP. That means a CD with its own unique product key (the long number you have to enter when you install Windows). If someone else is using the product key, you won't be able to activate Windows. If you're reading this before June 30, 2008, you can still buy a retail copy of XP. Microsoft will stop manufacturing the OS on that date,&#160;after which&#160;it will be harder, but probably not impossible, to buy. Remember that selling or buying a used copy is legal as long as the original owner is no longer using the software. And some PC makers are taking advantage of a Microsoft licensing loophole to offer downgrades to XP with the purchase of a new Vista PC. For more on obtaining XP after June 30, check out Preston Gralla's informative "How to Get and Keep Windows XP After June 30." For more, see the original forum question and responses.